Eurostar was a joint venture operation for running fast trains in the Channel Tunnel under the British Channel. It was founded by the state railway companies of France, Belgium and the United Kingdom as a joint venture. After privatisation of UK rail traffic, the UK part was transferred to a company called London and Continental Railways. 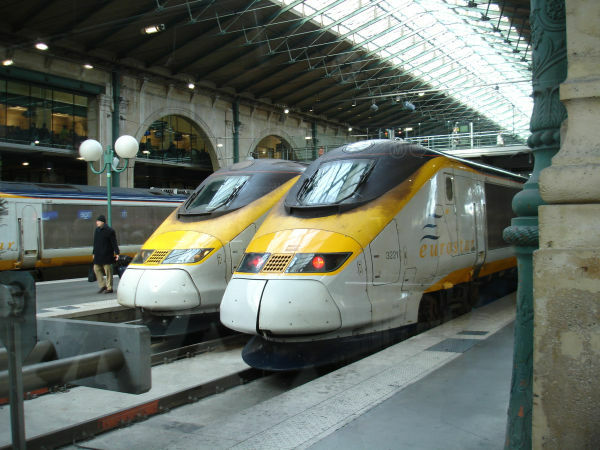 Eurostar operated as a joint venture 1994-2009 and has ever since been an independent international train operator of its own. Its main starting points are London St. Pancras, Paris Gare du Nord and Brüssel Midi / Brüssel Zuid. Other served stations extend all the way to Marseille in the south of France. 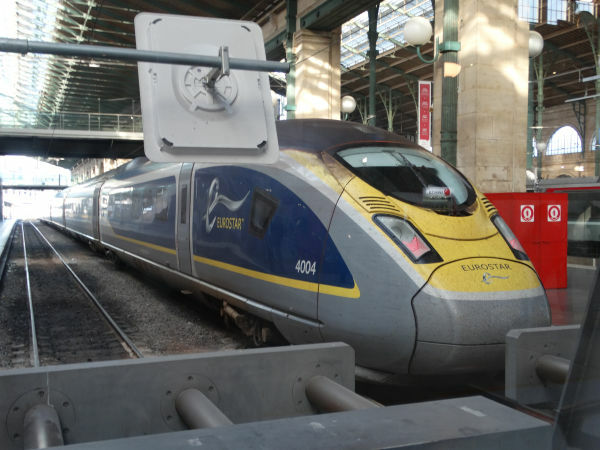 Eurostar's fleet consists of 27 of class 373/1 (e300) sets, based on French TGV technology, plus 17 of the new class 374 Siemens Velaro trains also known as e320. This picture, taken through a safety glass at Paris Gare du Nord shows three of the older class 373 sets. This model was built by the French company GEC Alsthom at its sites in La Rochelle (France), Belfort (France) and Washwood Heath (Britain) and by Brugeoise et Nivelles (BN, now part of Bombardier Transportation) in Brugge (Belgium). The typical trainset is called "Three Capitals" and it is a remarkably long train consisting of 20 coaches. There are also shorter, 16 cars long sets called "North of London", which were intended as the name applies, for across the Channel tunnel traffic extending far inland into the British isles north of London, but this service never materialised. Some of these sets were subsequently used by the French SNCF in French inland traffic. For pictures, see this archive railpics.club -> France -> TGV. All the trains in this picture are "Three Capitals" sets in their first (older) livery. Pictre from Paris Gare du Nord 27.1.2008 by Sanna Siissalo. This is the brand new Eurostar. It is a Siemens Velaro, based on the earlier German ICE3 Baureihe 407. 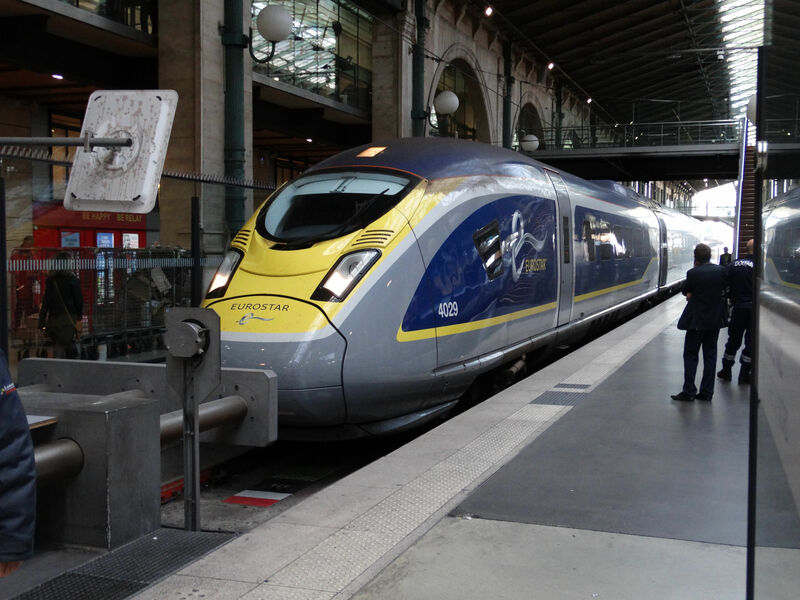 Eurostar calls it e320. In contrast with the older trains which were further developments of French TGV trains and which only had locomotives or power cars at each end, the Velaro has engines spread around all of the train. The Eurostar Velaro is a 16 coach long train, 400m long, with a power output of 16 MW (!!) and capable of driving under 25 kV AC, 15 kV AC, 3 kV DC as well as 1,5 kV DC. It has space for 902 passengers. Top speed is 320 km/h. Picture from Paris Gare du Nord station 20.10.2017 by Ilkka Siissalo. Another one of the new Velaros seen through a somewhat dirty safety glass window. Picture from Paris Gare du Nord station 20.10.2017 by Ilkka Siissalo.